The UFC has made it a priority to have a significant presence in New York State. Ever since the longtime ban on professional MMA in New York was lifted in early 2016, the UFC has made it a point to bring a big card to Madison Square Garden every year, starting with the monster UFC 205 event where Conor McGregor became the first UFC fighter to hold titles in two different weight classes simultaneously. The UFC has also frequented Brooklyn in the past few years. On this page I will outline the best betting site for New York residents, look at the basic legal questions surrounding sports betting in the state, explain the main UFC betting options using examples, and provide a 3 step guide you can follow to get your UFC bets placed online from New York. BetOnline is our top rated betting site for New York residents looking to bet on the UFC. BetOnline has been serving the United States betting market since 2004, and has built a strong reputation as a trusted and secure betting platform that accepts players from across the United States (no state restrictions). BetOnline is one of the first sportsbooks online to add betting lines for upcoming UFC events, and they also offer a wide variety of prop bet options for all UFC fights. At this time, it’s not legal to operate a sportsbook in the State of New York. That said, it’s not against the law for New York residents to join and place bets through offshore betting sites that are licensed and regulated outside of the United States. BetOnline is located and regulated in Panama, and they accept players from everywhere in the USA, including New York. You can check out our sports betting in New York City page for a little bit more on this subject. The UFC bet that takes the vast majority of action is simply wagering on who will win the fight. Here’s a look at the odds for the ESPN+ 1 main event between T.J. Dillashaw and Henry Cejudo, which is taking place in Brooklyn. In this example, Dillashaw is the favorite to win the fight at odds of -205. This means you would have to risk $205 on Dillashaw to win $100. Cejudo is the underdog at odds of +175. This means a $100 bet on Cejudo would win $175. The “to win” odds are also referred to as the money line odds. To win this type of bet, the fighter you wagered on simply has to have his hand raised at the end of the fight, regardless of how the win happens. 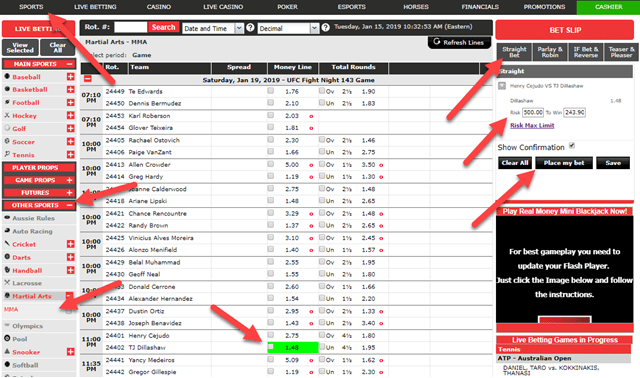 Total Rounds – This is the other betting line shown on the Cejudo vs Dillashaw screenshot above. It’s an over/under bet on the length of the fight in rounds. The Cejudo vs Dillashaw example shows an over/under of 4.5 rounds. If the fight finishes before the halfway point of round 5 then the under bet is a winner, while if the fight ends after the halfway point of round 5, or ends by decision then the over bet hits. Method of Victory – My favorite type of UFC bet. With this wager you are betting on the winner of the fight PLUS how they will win. For example you could bet on Dillashaw to win via decision, knockout, or submission. Round Betting – A bet on the winner of the fight PLUS which round they will win in. For example, betting on Dillashaw to win in round 1. Follow these 3 steps to get your UFC bets placed online from anywhere in New York State. BetOnline is the top sportsbook for New York residents. After logging in click on the ‘Cashier’ button in the top right corner of the screen. Select the deposit method you would like to use and follow the instructions to complete your deposit. You can enter promo code BOL1000 when making the deposit to opt-in to the 50% matching bonus up to $1000 on your first deposit. Click on ‘Sports’ from the top menu bar on the BetOnline website, open the ‘Other Sports’ drop down menu and select ‘Martial Arts’ -> ‘MMA’. Select the bet you want to make and click on ‘Straight Bet’ on the ‘Bet Slip’. Enter your risk amount and click ‘Place my bet’ to confirm your wager. If you’re a new bettor I’d also suggest checking out our sports betting guide section.